Srikanth Reddy talks poetry, inspiration, and professorship in anticipation of his talk on November 5, 7 p.m. at the Ransom Center. Innovative and experimental in his writing, Reddy has published two volumes of poetry, Facts for Visitors (2003) and Voyager (2011), and the critical work Changing Subjects: Digressions in Modern American Poetry (2012), in addition to working as Associate Professor within the University of Chicago’s Department of English. Exploring a diverse array of themes such as home and transnationalism, Reddy’s work cycles through a wide variety of poetic form. 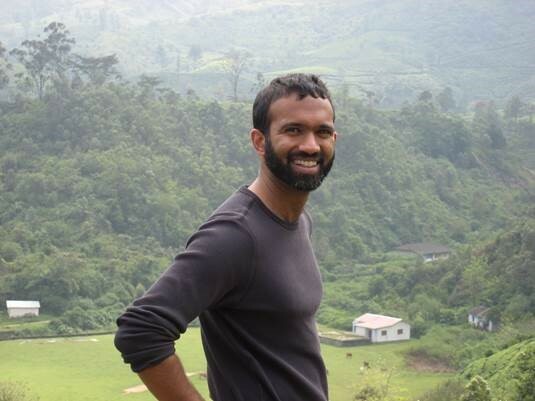 Srikanth Reddy. Photo by Suzanne Buffam. Reddy will be speaking as part of the Bagley Wright Lecture Series, a nonprofit organization that allows for poets to travel across the nation and discuss the poetic depth of their works. His visit is co-sponsored by the Department of English at The University of Texas at Austin and the New Writers Project. The program is free and open to the public, but donations are welcome. Doors open at 6:30 p.m.
You grew up in Chicago but maintain strong ties to Southern India. How do you conceptualize home, having broached this theme in your writing? Has that definition evolved as you’ve gotten older? Home has always been a vexed question for me (and for practically everyone I know). Growing up in Chicago but coming from a South Asian heritage, I never felt quite at home in my surroundings—and I think my first collection of poetry reflects that condition of “unbelonging” in all sorts of ways. The book’s title—Facts for Visitors—speaks to this problem, I think. I’ve often felt like a disoriented traveler through the terrain of my own life. My second book, Voyager, addresses these questions as well. If I started out as a poet with the sensibility of a “visitor,” I think I came to imagine the writer as a “voyager” with a more sure sense of purpose—ethically, politically, and artistically—in the next volume. Now I’m working on a book called “Introduction to the Underworld,” which, you can imagine, entails its own kind of journey and longing for home. In addition to your work as a poet, you obtained the position of Associate Professor, working in the English Department at the University of Chicago in addition to your work with the Program in Poetry and Poetics. Has the experience of working with and guiding young writers influenced your own poetry? Absolutely. The book I’m writing now is, in fact, a long narrative poem about teaching—it’s a kind of academic satire, but I’m trying to foreground my own pedagogical pretensions and shortcomings as a teacher, rather than satirizing the institution as a whole. I think there’s a lot you can do with the “mock-didactic” register—out of fashion since the great era of Pope and Swift—that opens up ways of thinking about teaching and writing through the lens of humor. I don’t want to romanticize myself as a teacher in this work, but I also want to honor the ways that I learn from my students every day. They’re far more talented than I was at their age! There are seven years between the publication of Facts for Visitors (2004) and Voyager (2011). How did your ideals of poetic form and inspiration evolve within that period? Should readers approach Voyager as expanding upon the ideas laid out in Facts for Visitors, or should the volumes be viewed as two separate works? At the time, I thought of myself as doing something completely different in Voyager than I’d done in Facts for Visitors. After all, that first book is a collection of lyric poems—using forms like the villanelle, the sonnet, and terza rima—which explores questions of displacement and desire in various ways. My second book is a (very) long poem in three parts that takes the form of a literary erasure of Kurt Waldheim’s memoirs—an entirely different approach to writing, right? But looking back, I see that many of the concerns and even specific motifs—the underworld, the Voyager spacecraft, theatrical stage directions—surface in both works, and, in a sense, unite them. Now, as I work on my third book—which I’m provisionally titling “Introduction to the Underworld”—I’ve come to see the overall trajectory as a kind of literary trilogy. We’ll see how it goes . . .
You have described the style of Voyager as the “experimental method of literary erasure,” or the deletion of language from a pre-selected source. What drew you to this particular poetic style? Basically, I stumbled on erasure as a literary method by happenstance. I went through a crippling bout of writer’s block after the publication of my first collection—not uncommon among poets at the start of their careers—and I simply couldn’t find it in me to put together a single line of poetry. But I noticed that I was finding new phrasings, gestures, and opportunities in my own students’ work every time I edited, marked up, and crossed out language from their poems. So I began to think that maybe I could create poetry by “editing,” or eliminating words, from other texts—the dictionary, the newspaper, anything, really. Once I came across Kurt Waldheim’s memoir—he was Secretary General of the United Nations in the 1970s, later discovered to have been a senior SS officer in Hitler’s Germany—I discovered the perfect book to erase. (His memoir is full of silences and secrets that I wanted to “erase” into art). I actually ended up erasing Waldheim’s book three times, and the results became Voyager. As a poet, where do you find your greatest sources of inspiration? Oddly enough, I find my greatest sources of poetic inspiration in writing that isn’t poetry these days—visual art, philosophy, contemporary Latin American fiction, all sorts of places. I think it’s important to look outside poetry in order to bring new things—new styles, new methods—into the art. Of course I practically worship many poets—Emily Dickinson, Wallace Stevens, Ronald Johnson, the list goes on—and there are incredible things happening right now in contemporary poetry, too. But I also think old encyclopedias and atlases or medical journals or political pamphlets can open up new ways of writing as well. That, for me, is where it’s at—at the moment, at least.